We found 459 matching items. June 1, 2005 This certificate was given to the Blind River Library in recognition of its participation in the Cooperative Education Program from L'Ecole Secondaire Catholique Jeunesse-Nord. 20 Apr 1913, Provided by Ray McCoy. 25 Dec 1931, This poem was written by Wilbur M. Edy and presented to his friend Payson Vivian in gratitude for the help which Mr. Vivian had given him when he was ill.The original can be found at the Oakland Branch of the County of Brant Public Library. July 20, 1933 This paper states that Gordon Maracle had passed the courses necessary to continue on to High School. 28 Apr 1831 This document was created to certify the marriage of Herbert Biggar and Jane Ellis at Salt Springs Church on April 28th, 1831. The ordained minister was Joseph Gatchell. This document was provided by Linda Guest. 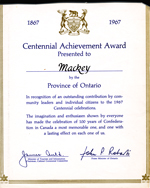 1967 Award given to municipalities in recognition of outstanding contributions to the 1967 centennial celebrations. April 13, 1877 The marriage is between Carl Gutzmann of Petawawa Township, Renfrew County and Emilie Lindemann of Alice Township, Renfrew County on April 13, 1877. Witnesses of the marriage were Adolphe Lindemann and Louise Witt, both of Alice Township. 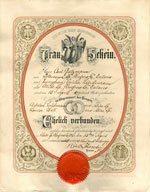 The marriage was officiated by Pastor Robert Schroeder.